Dualog® Network Control handles automatic failover and least cost routing between any IP-type carriers. This service provides shore-based, centralised administration via Dualog.net – no configuration or maintenance is required on-board. Fleet-wide configuration from shore enables a single policy to control all ships. Create separate networks – e.g. for business and personal traffic. On-board network separation prevents viruses spreading to business critical computers. Optional configuration for multiple user groups enabling prioritisation. Block unwanted traffic to maximise bandwidth availability and control cost. 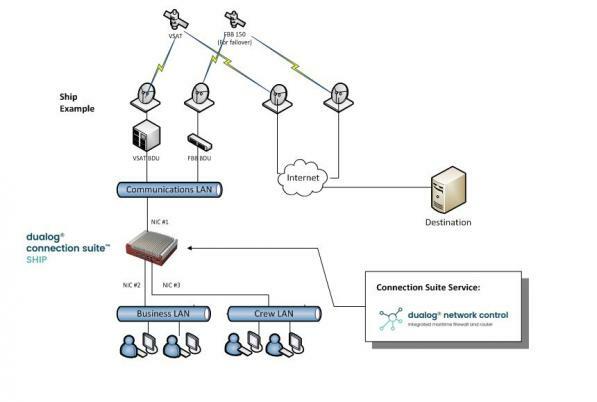 Network Control is managed from the company office via dualog.net. The ship software is configured via a combination of fleet-wide and ship specific rules. The company Administrator manages rules to block, restrict or allow different IP-based services such as e-mail, Web browsing, instant messaging, VoIP, file downloads, FTP (etc.) per network, VLAN, computer, user group or individual user on the ship.